On average the NHS deals with one million patients every 36 hours, or 463 people a minute. London, England (CNN) -- After weeks of feverish election campaigning, Britain's political parties have fought over every issue, from the economy to the country's nuclear deterrent, with one exception: the National Health Service. Over the years it can boast pioneering breakthroughs and public health campaigns, from Britain's first heart transplant in 1968, to the first major Aids awareness drive in the 1980s. One of its most ambitious projects was the 1988 breast screening program, providing free mammograms to reduce breast cancer in women over 50. The scale of the NHS is vast. Only the Chinese People's Liberation Army, the U.S. Wal-Mart supermarket chain and Indian Railways directly employ more people, it claims. But the cost of maintaining an extensive healthcare system is an increasing burden on national coffers, as Britain's aging population needs more treatment. Centrally-funded through taxation, pressure to respond to growing demand has seen record levels of investment in the past decade. According to Britain's Department of Health, the current annual NHS budget is $162 billion -- almost 18 percent of total public expenditure. Despite massive investment in aging infrastructure and services, the current Labour government is accused by political rivals of mismanaging major projects such as the computerization of all NHS records. The government has also tackled other issues such as treatment waiting lists and a "post-code lottery" system in which decisions about who gets life-saving drugs are based on the budget of local health authorities. Non-partisan health think tank, the King's Fund, found wide geographical variations in cancer treatment budgets for example. Nevertheless opposition Conservative leader David Cameron seems as committed to the NHS as Labour, despite his party's ideological disposition to the private sector. He recently acknowledged its value on his party's Web site. "Millions of people are grateful for the care they have received from the NHS -- including my own family," he said. "One of the wonderful things about living in this country is that the moment you're injured or fall ill -- no matter who you are, where you are from, or how much money you've got -- you know that the NHS will look after you." Cameron's words were reinforced by the party's election manifesto, in which it calls itself "the party of the NHS" and pledges "never to change at the idea at its heart that healthcare in this country is free at the point of use and available to everyone based on need and not ability to pay." This is a major shift away from previous Conservative leaders. Margaret Thatcher encouraged people to use private medical services and proposed tax breaks for private health insurance in the 1980s. The Liberal Democrats are equally effusive about the need to protect key parts of the NHS, such as cancer treatment and maternity care, but have refused to rule out future cuts. 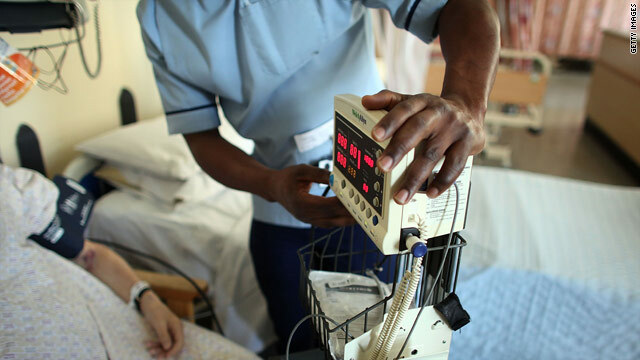 Ruth Thorlby, a research fellow at the King's Fund, told CNN that all the major parties appreciate the NHS strikes an emotive chord with the public and that it is a price worth paying. She said: "We have this extraordinary political consensus now that the funding structure of the NHS is sound. Differences over individual issues, such as the funding for the care of the elderly or expensive drug treatment, will be debated after the election." "Millions of people are grateful for the care they have received from the NHS. But across the Atlantic, critics of publicly-funded healthcare paint a darker picture of the NHS -- emphasizing long treatment queues and arbitrary decision-making over the allocation of drugs -- as they warn of the consequences of President Barack Obama's own health reforms. With more than 40 million people in America lacking health insurance, Obama's overhaul of the system extends coverage to about 32 million of them, funded in part by taxes. Last year, former House of Representatives Speaker, and leading Republican, Newt Gingrich warned the U.S. was in danger of replicating Britain's "socialized" health system which is run, he said, by "Orwellian" bureaucrats who put a price tag on life. But Thorlby, who spent a year in the U.S. studying healthcare, says of the Republican viewpoint: "They are worried about rationing by government or an official bureaucrat making decisions about who gets what. "Bureaucrats within private health insurance companies are making these decisions all the time but Republicans would argue that your freedom comes through the ability to switch between policies and that a big government funded health sector would restrict choice." According to Thorlby, many in the U.S. would be surprised to learn about the existence of private and independent elements working within the NHS, helping to make crucial decisions about services in an effort to improve efficiency. For example, the Labour government set up the National Institute for Health and Clinical Excellence (NICE) in 1999. An independent organization, its job is to recommend which drugs and treatments should be available free on the NHS, based on scrutiny of clinical and cost effectiveness. While not straightforward to do the same thing in the U.S. because of sensitivities around rationing by a government body, Thorlby said many health policy experts in America she has spoken to see value in having someone able to say: "Look this drug is just not cost-effective, based on the best available evidence." Another area likely to surprise Americans, according to Thorlby, relates to hospital access. "In England people can choose to go to any NHS or approved private hospital for their NHS care, but across the Atlantic -- apart from those with really expensive insurance cover - most plans restrict you you from going to any hospital anywhere you want. "You have to go to a network of hospitals the insurance company is contracted to, or pay extra." Differences between the UK's main parties will inevitably surface in future about the best way to manage the NHS, especially if the cost of maintaining it continues to rise, but for now it appears to be politically "untouchable."